Spring is slowly showing its face and aside from the drivers who couldn’t wait for the snow and mud to go away, their cars must be ecstatic as well. They’d tell you so themselves – IF they could talk. A little more time and gone will be the dangers of cold weather – corrosion, tire pressure fluctuation, dead battery, thickening fluids, wiper malfunction, leakage and increased fuel consumption. Gone will be slippery and ice-covered roads and heavy tires to go tackle them will be ready to be taken off. But when is a good moment to switch your winter tires and go with the all-season or summer ones? Stay with us to find out! Winter driving can be challenging, as every experienced driver will tell you. While Quebec is the only province in Canada where it’s mandatory for every vehicle to have winter tires, all Canadian provinces recommend installing 4 winter tires when the temperature drops below +7°C. Winter tires have replaced what used to be called snow tires, the main difference being in the tread pattern. Snow tires had deeper grooves for gripping the snow, but the rubber got hard when it was cold and didn’t work so well on ice. Today’s winter tires have a tread designed to give increased traction, braking and handling on cold and dry pavement as well as in both snow and ice and still remain softer in the cold. Transport Canada recommends installing 4 winter tires to maintain control and stability of your vehicle in icy conditions. Since winter tires work best in snow and icy conditions, at a maximum temperature of +7°C, you can swap them for all-season or summer tires when the temperature is steady above that. However, with notoriously fickle springs in Ontario, it’s important that you keep an eye on temperatures for at least several consecutive days before making the swap. March and April are transition months during which there is much climatic instability, and the variations between winter and spring-like weather conditions can be wild and intense. Therefore, if you are unsure about how the weather will bear out, it’s better to hold off on taking off your winter tires. You should also look at your auto insurance policy to help you decide when to swap winter tires, since many insurance companies offer discounts in Ontario if you have 4 winter tires on your vehicle and usually within a time window – from November to April. So, keep an eye on the mercury in the thermometer, check the forecasts, read your insurance policy and above all, take your time before deciding to remove your winter tires. Just don’t wait too long. The hotter it gets, the harder it is on winter tires, so the longer you wait, the more your snow tires could be affected. That’s because winter tires usually have more “sipes” (thin slits across the surface of a tire, often in a zig-zag pattern and tread blocks to maximize traction in the snow and ice. Therefore, the hotter it gets, the more you may start to lose traction due to the extra siping and tread blocks on your snow tires, resulting in a ‘greasy’ feel. This is extremely important because losing traction may affect braking efficiency and collision avoidance abilities. Also, don’t be tempted to keep your winter tires on year-round as you could be more at risk by driving with winter tires on hot pavement. Before you make the decision to switch your winter tires from your vehicle, use the time to find them a proper place to store them until next winter. Winter tires tend to cost a bit more, and careless storage could mean they’ll be unusable for next winter. It’s important to purchase a durable tire bag for each of your four winter tires – don’t just buy 2 and place them in between your tires. Stack your tires carefully once they are wrapped in the bags and make sure they are away from any water or substances that could cause damage. Always store your tires in a cool, dry place to preserve their air pressure and to prevent the rubber from cracking or becoming damaged. 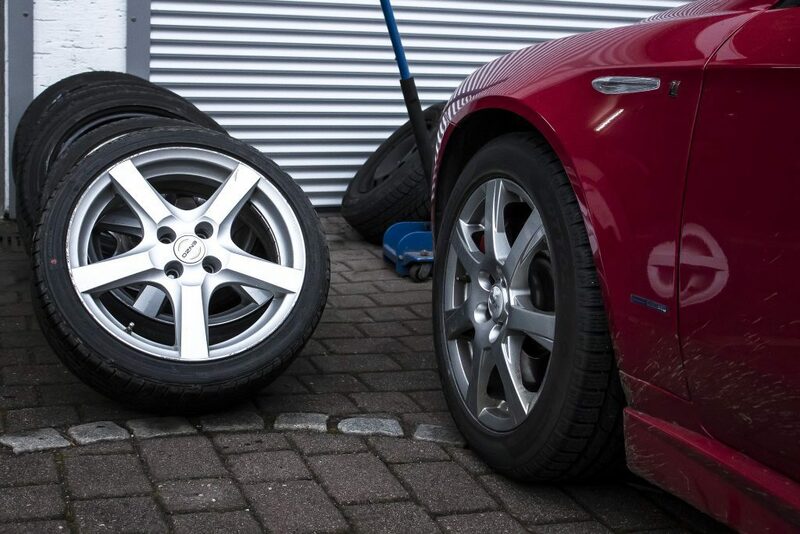 You can also have your tires stored with your repair shop, which will take care of them for you during the summer months. Bring your car to your trusted mechanic and we will take care of your car like our own. Come to our repair shops in Hamilton and Oakville today!